The systemwide award recognizes the efforts of an individual from any facilities management office who has exhibited superior performance in a maintenance, landscaping, custodial, shop or trucking position. Highlights include JABSOM scholarships, increased research funding, the President's Award for Excellence in Building and Grounds Maintenance and more. According to many glowing accolades, Son always goes above and beyond her required job responsibilities and is committed to keeping a safe and spotless working environment for those in her offices. The systemwide award recognizes the efforts of an individual from any facilities management office who has exhibited sustained superior performance in a maintenance, landscaping, custodial, shop or trucking position. 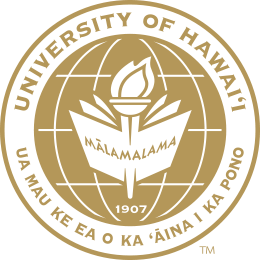 David Apostol was honored with the University of Hawaiʻi’s Presidents Award for Excellence in Building and Grounds Maintenance. Neal Nagao honored with the University of Hawaiʻi President’s Award for Excellence in Building and Ground Maintenance. Leeward CC’s Joseph Tan and UH West Oʻahu’s Erline Vasconcellos were presented with the President’s Award for Excellence in Building and Ground Maintenance. UH West Oahu Facilities Manager James Yamaguchi awarded the 2013 President’s Award for Excellence in Building and Grounds Maintenance.